' Tip of the Iceberg' has found it's new home, right here on Bainbridge Is. It is a good feeling when someone finds your work resonates with them enough to make it their own. It’s quite an honor knowing they wish to bring it in to their life and home. People often ask ‘how can you let them go’ and I’m happy to admit it wasn’t always so easy for me. Early on in my painting career, as I was building confidence in my muse, I was somewhat afraid if I let a painting go I may never paint anything like it again. It’s funny because even when I intentionally set out to create a series I can’t copy my own work, I have to create them simultaneously to capture the same energy flow. In hindsight, it makes perfect sense, every day is different and painting daily becomes like a creative diary of sorts… the painting becomes a time stamp of the thoughts, emotions and inspiration of that moment. It isn’t something I can fake or try to pull out from another time and place. it is all very present. That is one of the things I love most about creating, it forces you to be present in the moment. I am much more confident that my muse will appear when I front up in the studio now. Twenty years of doing so has shown me there is always something waiting to be expressed. ‘Tip of the Iceberg’ was one of my first paintings in 2018 which incorporated art journaling techniques with painting on canvas. It felt good. It felt like the start of something new and it was. I have continued to use canvas the same way I was using my art journal pages, as a place to explore feelings using mixed media and not only oil paint. I will always love painting in oil, my first love, but this has extended my vocabulary and the process is engaging and rewarding. I hope ‘Tip of the Iceberg’ gives as much joy to the collectors as it gave me while creating. Happy to share that Pegasus Coffee House on Bainbridge Island, Washington has asked me to be their Artist of the month for April. We open the show on the 5th of April coinciding with First Friday Artwalk. There is an opening reception between 6-8pm with Live music from Heddwen and Meg Dolde too! Hope you can make it to join us for a fun night of Art, Music and Wine of course! Heading off today to hang the show! Glenn Eure's 'Ghost Fleet Gallery' 24th Annual Self Portrait Exhibition. This is No April Fools…..Tonight is the opening of the Glenn Eure’s Ghost Fleet Gallery’s Annual Self Portrait show. There is a special wall dedicated to Glenn this year, with a retrospective showcasing a collection of his own self portraits. I wish I could be there in person to toast Glenn and all he has done for the arts and of course sample the highly regarded culinary delights by obxdougart. More for everyone else…this time! I am exited to have an entry included although I admit it was much more challenging than I anticipated. Why is it so hard to paint yourself? I struggled with multiple attempts using the mirror and taking photo’s and eventually decided to go by feel and represent myself energetically. I am not entirely sure how I feel about the outcome but I am really pleased to have had the opportunity to push myself out of my comfort zone. Glenn would have liked that, he was a boundary pusher and liked to encourage others to do the same. Here’s ‘CHEERS’ to you Glenn and a big hug to your darling wife Pat! Congratulations on the 24th Annual Self Portrait show! Self Portrait capturing essence rather than a realistic image. Birthing the 'Cedar Bar Shenanigans' project. - 20 Artists sharing the canvas. I was inspired recently to send out an open call among my fellow artist students among a group of MoMA alumni peers. I did not expect 20 artists to answer the call or that it would cross overseas but that is the diversity of online education and networks and the enthusiasm of a supportive artist group eager to participate in a creative endeavor, for which I am grateful. The naming of the project inspired by the gatherings the NY School Ab/Ex artists had at The Cedar Bar in NY during the 50’s and 60’s. The beginning of ‘Cedar Bar Shenanigans’ was raw when I presented the idea but I’m fortunate the process of how to get a collaborative process up and going became clearer. I learnt it is best to be clear in statement before introducing an idea to a large group and to have guidelines or boundaries in place as imagination is wide. It makes it easier when you then include personalities, cultural understandings and personal expression in the mix. A collaboration works best if all parties are equal in importance and symbiotic in relationship. 8” x 10” double gesso’d canvas ready to send out. The original idea was to circulate one painting between all the artists and see how each persons way of working affected the outcome of the whole. To understand how one persons work influence the next artists choices by means of asking each artist to record their initial impression of the work received and to state why they were altering it the way they had. The only creative guidelines were to take inspiration from one of the Abstract Expressionist artists we had studied together at MoMA and to only hold the painting for a week in order to keep it moving in a timely manner. Of course with International participants, postal service had a role in the timeline as well but there was no hard deadline for this reason. The medium chosen was acrylic, personally as an oil painter this was a challenge, but the fast drying time was important for the timeframe too. After much discussion, concerns raised about cost of postage and the percentage of any one artists work that would remain with a large number working on the painting, it was decided to break the larger group of 20 artists into 4 groups of 5 artists each. This meant additional effort to prepare 4 canvases and mail to 4 artists to begin the project but resulted in a clearer definition of work from all the artists involved and more regional groupings but also quartered the time frame to conclusion of the project. I set up a google drive for loading ‘before’ and ‘after’ photographs and a word document to record artists’ impressions and intentions. This documentation would become the resource for printing the material to create a sketchbook, which will be sent to the Brooklyn Art Library for inclusion in their permanent collection to travel the world. Here is a link to the Sketchbook project @ Brooklyn Art Library for further information. I highly recommend artists consider purchasing a sketchbook to complete and send in to the collection. It is an exciting project and a wonderful resting place for our collaboration. It allows the project to live on in another form of collaboration between artists, sharing art with a wider audience. By purchasing a sketchbook to fill you are enabling this crowdfunded project to continue its work. At present the paintings are circulating, the photo’s, impressions and intents are being collected and I look forward to compiling the sketchbook once all 4 canvases are complete. It is inspiring to see how others are interpreting the guidelines and I am delighted it has provided an opportunity to revisit some of the lessons we undertook together in our Materials and Techniques of Postwar Abstract Painting course. During my week with the canvas, the Pacific North West experienced a once in 50 years snow storm, dumping 14”s of snow in 48hours starting February 8th. We were completely enveloped in white, a new experience for me. During this time I heard that one of the artists we studied- Robert Ryman, died (in NYC- aged 88yrs) on the day of the storm. Ryman was known for his ‘white’ paintings, and his exploration of paint and its qualities had no formal arts training but spent 7 years as a security guard at MoMA soaking it all in. It was a no brainer for me…I was choosing to reflect on Robert Ryman’s Techniques for my inspiration. The snow, his connection with MoMA left no doubt. I had purchased some acrylic paint for an art journal course I was undertaking and when I set out to begin my study of white I discovered one of my paints was named Snow, of course I had to choose it. It matched well with my source of inspiration as Ryman was known to like the blue tinge of a ‘cool’ white too. As the first artist in my group, painting a white surface left plenty of room for the next artist to engage in the way they saw fit. I covered 1/2 of the canvas is very small strokes, providing a textured ground to bounce off, yet leaving enough clear space for them to play. If I was more familiar with acrylic I may have had a medium gel on hand to help with keeping the intended texture. Acrylic is plastic and therefore settles somewhat as apposed to keeping its shape the way oil paint does. The result was a little flatter than I had hoped but after 2 layers of same, i realized it would be built on in future efforts and I had no means of leaving the house at that point as we were snowed in! Robert Ryman inspired stokes of white. As first artist in my group, I was inspired with a blank canvas, my environment and the news of Ryman’s passing. Inspired by Seattle snowfall and the infinite possibilities of our collaboration. I hear the news. Robert Ryman died. Simplicity at the forefront. Only brushstroke and paint remain. The paintings are in circulation for at least a month more but I am excited by the contributions already and look forward to sharing the compilation at the conclusion of this project. It will be interesting to see how each artist influenced the next and we will all be able to see the thought process and progress of the paintings as they traveled from one to the next. I am truly grateful for all the participants in making what started out as a fun idea conceived one afternoon in my studio, into a reality connecting 20 artists with a united goal from all over the world! May it be the first of many collaborations. This post was written in Jan 2017 and archived as a draft. I found it today, January 2019. There may not be many posts but when there are it counts. During an interview last week regarding the R-evol-u-tion project, it was brought to my attention by the reporter that it was important to share the story of the themes of each group of Tiny Talisman that have gone out into the community. It hadn't occurred to me previously as it is part of my process and not something i thought would be of interest to anyone else. She begged to differ so I thought I would share with you. The original 100 Talisman were created with the intention of 'ONE'. That was the theme in my head as I laid down the layers. I painted an abstract self portrait and wrote the word 'ONE' over it. The colors were candy, rainbow colors to signify inclusion of all. Then I added layers of red, white and blue paint. This was to symbolize the America we create together. The second group of Talisman (100-200) begged to be green and blue with hints of orange and yellow. At the time of their creation (Nov) I felt soothing, calming colors were warranted. White was also included in the layering process as white includes all color in it's resonance. The orange and green highlights were symbolic of the spark of spirit. The next group of 200-250 are earthy tones for grounding. For helping us place our feet firmly on the ground and centering ourselves. There is still much work to be done. I am now preparing another 'batch' of Talisman to go out into the community. They have begun their life as pastel shades. I am not sure what I will paint next. It is very much an intuitive process at the time of creation. Bainbridge Island Winter Studio Tour- Nov 30, Dec 1 & 2 -2018. I am pleased to announce I will be a contributing artist at the Bainbridge Island Winter Studio Tour this year. It will be the first time I am sharing my new work publicly, since moving to the Island a year ago. I have a made a selection of small work especially for this show but will also have a few of my larger works available too. I have really enjoyed creating smaller works specifically for this Studio Tour as I most often work on larger canvas. The smaller works have been a great opportunity to unite my art journaling practice with my painting practice in the form of mixed media canvases. There will be a number of 8” x 10” and smaller works available, including framed, free standing, 2” x 3” #tinytalisman , a new offering just for the event. I hope you will be able to join us in this exciting showcase of local artists work on Bainbridge. The dates are: Nov 30th, Dec 1st and 2nd from 10am -5pm each day. My work will be in studio 5 at the Masonic Lodge, located at 1299 Grow Ave NW. Glenn Eure's 'Ghost Fleet Gallery' 23rd annual Self Portrait Exhibition. I am thrilled to be participating in this years 'Ghost Fleet Gallery's Self Portrait Exhibition'. Glenn Eure is himself an artist and beloved personality around town, he has held this exhibition at his gallery in Nags Head, North Carolina for 23 years now. Ghost Fleet Gallery is known as the official hub for the Arts on the Outer Banks. Lucky for me, this years theme is 'open' as I am not a traditional painter and my figurative self portraits are humbling at best. I am sending an abstract self portrait titled 'Inner Life'. It consists of torn self portraits on paper and journal style writings creating a landscape of my inner world. There is a harmonious order among the seeming chaos, I think it is a very apt representation! I have heard Doug Brannon (fellow artist and friend) is catering this event, as well as having an entry in the show, so save some room at lunch for some delicious appetizers and dessert! In January, I had the honor of being included in MoMA's exhibition 'In The Studio' to celebrate their online learning community. A call went out from MoMA to students of the course to submit a work for inclusion, I chose my 'Homage to deKooning'. It was accepted. I chose this work because it was the week I struggled most during the course. I didn't resonate with deKooning's work and found what I learned about his personality further distanced me from his paintings. His mixed feelings about woman were evident in his gnarly faced, angry portrayals. Toward the end of the week while discovering his later, more simplified work I found a connection with his fluid ribbons. From memory, I believe it was as he developed suspected Alzheimers that his work became softer, something I could feel without jarring. His Woman series just made me feel angry. I suspect I am not alone. Of course our emotional response to an artist is a direct reflection of ourselves and I was willing to investigate further but was surprised at how difficult it was for me to execute a painting in the style of the 'Woman' series. I spent all week scraping and repainting and turpentine rubbing off area's not to my liking only to repaint and try again. On the very last day I literally scrapped off most of the figure and began working more abstractly, letting my wrist guide the way with fluid strokes that came together in the final result which is more indicative of deKooning's final works. This painting really taught me a lot about myself and that's the reason I chose to submit this one. I didn't get to go to NY for the opening of 'In the Studio' but many of my fellow Alumni did. It was a wonderful opportunity for them to meet in person and celebrate the teachers, faculty and the journey we took together as artists with MoMA. I was honored to have my painting included alongside fabulous artworks made by students, exploring the style of the artists we studied from Postwar Abstract NY Painters. Here is a youtube slideshow of some of some of the work shown. My own painting is at 2.06 in the clip. The images in this slideshow were created by learners enrolled in "In the Studio: Postwar Abstract Painting," an online by MoMA on Coursera, and were submitted to an open call for the exhibition "In the Studio: Art by MoMA's Online Learning Community," on view at MoMA January 5-22, 2018. Journaling with mixed media on canvas. I am focusing of late on art journaling and translating the process to smaller works on canvas (10"x 8") This has been such an interesting and informative period of experimentation. I look forward to warmer months when I can try the same processes in oil on larger canvas in my dedicated studio space. In the past couple of months, things changed very quickly. I kid you not. We moved states. Literally. I have not had much time for painting which is most rare regardless the circumstances but I have a designated space set up to work with art journaling and related concepts and exploring how that, now, is translated in the way I see my work. I am changing, my work is changing. I have learnt so much. I've grown my disciplines, adding collage and multi media to my tool kit and my journals are becoming, it is time to start translating this expression on to canvas. It has been some months since I have written a post. Life has been so busy with personal things, there hasn't been much to tell with painting. I had packed it all to move with the exception of my main journaling supplies which we kept with us when moving. It became my staple. I am yet to begin a new series of paintings in earnest. We have just settled our family and begun a new adventure. My painting is reflecting that and it is mostly journal oriented. I have decided to share the process 'of becoming' as this expression finds it's way out. So in essence , instead of cataloguing work at the time of release with a series, I will share the journal pages as they are created, the artworks that come out of this time will be my next body of work. I'm surprised by this evolution in mixed media but am deeply involved with the process of daily journaling, and excited at the prospect of broadening some more. Sculpture is in my sights, as is installation pieces but first, we have some more settling in to do. Foundations are important for a long term vision. The forest is still informing me. A return to painting on canvas after an 8 month hiatus. 'Ancestral Journey' 36" x 48"
I have been called back to creating on canvas. I have made a few works in smaller tile format but it has been a while since I painted on a large scale canvas. I felt the pull lately and decided to let it out. I am so glad I did. I have another couple of months to complete the e-course I am undertaking in art journaling (Metamorph- Erin Faith Allen) and will continue to explore suggested topics and techniques, but I feel it is time to integrate the new ways of working into my regular arts practice. How can an artist ever keep new discovery separate? The style of working in the art journal seems to translate easily on to canvas. Many of the influences, such as the reference to ancestral bones (past) and sewing like, mark making (integration) have appeared in among fields of color, unwittingly joining the present to the past. I am enjoying the effect and the way the process feels on a larger scale. My work has always consisted of layering pigment and glaze in color fields, with mark making becoming more prominent since moving to California in my 'Fog Series' but I'm grateful for the way my experience with art journaling has allowed me to reach deep into the psyche in a deliberate manner to portray that excavation on paper and now on canvas. There is a freedom in the art journaling that has informed my painting in a way I may not have discovered on canvas alone. I have to be honest and say the past few weeks have been challenging, I have found it difficult to find my balance, I seem to be either entirely optimistic and full of faith or collapsed inside of a fearful moment. I have felt true emotional exhaustion and questioned my own faith in a benevolent society but I have also felt elation and connection more profoundly than ever before. I am so grateful for the clarity the process of painting provides me, as it is there I draw the fuel for balance-daily. There is definitely a shift occurring for all of humanity. The times I have felt fear are the times I know I have been resistant to change. Deep down I believe that all is well on our planet despite the atrocities still playing out in our growth curve, I know the Universe conspires in our favor. There is a saying that 'history repeats itself' and although it is often true, it is not steadfast or necessary that it does so. In fact with true growth it doesn't. When we know better, we do better. We have reached a point in time where some patterns have come up for review and seem to be highlighted for our attention, this is not so we feel condemned to repeat the past but to awaken the knowledge that we truly create our reality with our expectation and contrast has helped discern our preferences. That is why balance is so important now, we have a chance to create an entirely new paradigm. Where we focus our attention we add energy. Focus more on the outcome you desire rather than the problems you may perceive. There is always a silver lining to be found in contrast. It truly helps if you turn off the television and spend more time in nature and time spent creating something with joy can fill your soul with the energy needed to stay positive in those moments you feel the wobble. I saw a wonderful movie recently called 'Arrival', it suggests time is cyclical, which is a belief I have subscribed to for some time, but time is also subject to consciousness. We directly affect the future with our thoughts and our thoughts are changing. They are more inclusive and oriented in community than ever before, this is changing the outcome of the cycle we may have been destined to repeat without this growth in consciousness. Just like ripples on a pond, thought waves affect reality. Sometimes the best thing you can do for others is take stock of your self love and care. Our outer world reflects our inner, so if you want to see change in the world, you need to find that change inside of yourself first. The first order of the day is to find energetic sovereignty. You are the master of how you feel about anything. It takes some getting used to because we are trained from birth to look for guidance outside of ourselves, starting with our parents, but true guidance comes from within, from your direct connection with source. We are often so busy we don't have the space to connect with our inner self. Making time to do something you love in quietude affords you a place to connect. Some people find this in meditation or exercise, I find it in painting. Spend some time working out where that place is provided in your life. There is much on offer when you find it. My hope with the R-evol-u-tion project is that in making Tiny Talisman people would take a few moments out of their busy schedule to create and in doing so, may find more connection with themselves. It is not lost on me that in taking this time to create something to gift to another, one is gifted with oneself. We are living in a powerful era, what happens next is up to you. The R-evol-u-tion project grows and morphs in new ways. When I began this project, it was really a means for me to create Tiny Talisman's to share with my community for the good feeling it brought me and hopefully the finders. It was originally anonymous but after realizing it would be fun to witness the journey in the pay it forward idea behind them, I numbered them hoping people would log on to the fb page I created for the project (R-evol-u-tion) and share the number on the Talisman they found and we would be able to follow where they ended up. Needless to say I had to moderate the page, so no longer anonymous if people logged on. After many questions regarding how to and 'the rules' (there are none) I filmed a short video on my Iphone to explain the basics of the project and posted it on the page. No time to be shy. The entire project has been a steep learning curve. I have found many have not logged on to share finds although many have shared what they are creating to share in the same fashion in their own neighborhoods. I am not sure why people have not logged on with their finds but imagine it may be in part to social media cynicism. I understand not everyone may have access too but in this world of Iphones, some form of connection is usually available, so that has been interesting. It was never the focus of leaving the Talisman so it doesn't detract from the original intent, but it is a layer that doesn't get recognized as I thought it might. On the other hand the 'seeding' part of the project has grown much more quickly than I would have even hoped and I see a lot of value in that, as it means others are taking the time to create something with the intent for leaving it for another who may not even be known to them. No boundaries there, just one heart gifting another. I have really enjoyed people sharing their unique expressions with us on the fb page. A moment spent creating is truly a treasure. It is such an easy way to access your inner self and creates space for a few moments in the midst of busy schedules to do something quite simple and rewarding. Such a wonderful activity to do with children too, who are often less shy about committing marks on paper than adults who worry more about perfection, as usual the young have much to teach us! This Talisman was left in Dallas, Texas last week to surprise someone on a night out! We have a number of artists in Dallas, Texas creating and leaving Talisman and an artist in Michigan making beautiful works to share, a local writer has been writing notes to give to people she meets in her daily travels breaking down barriers and spreading light as her own expression of love. Of course not all whom are making Talisman are artists but of course it is appealing to those who already create and hopefully inspiring to those who don't normally make things with their hands. The local paper received an email about the project from a neighbor and followed up with an article which perhaps inspired some to get on board and begin creating their own Talisman too which is wonderful and possibly helped dispel some cynicism regarding the social media platforms, designed to further support sharing of the many layers this project offers for a feeling of community. Rose Locricchio from Michigan shared her creations on the R-evol-u-tion fb page with us! The Talisman are gifts, there is nothing to purchase in this project although there is a wealth of good feeling that is generated. That's the currency I am interested in! There have been some larger groups who are undertaking Talisman making projects of their own now too. This makes me very excited. It is amazing to think that each of these children will play a part in widening the reach of the project to the other side of the world. I hope they enjoy every aspect of it from creating to the good feeling of leaving their pieces somewhere, not to mention the goodwill created when someone comes across one on their travels. Other community groups are looking at ways in which to use the idea to compliment their own purposes in the future, which I truly look forward to witnessing. I imagine the tendrils of this project will travel widely over time, already a number of US States have people sharing what they have made or plan to do in coming months. Cheers for now, keep sharing the love! I really enjoy the process of preparing canvas for painting. I find it meditative and relaxing. A time when I may think about my intention for the painting to come. Generally preparation for a painting involves 2-3 layers of Gesso for me. (Gesso is essentially PVA and White Acrylic paint) Each layer needs to be dry before applying another. Once on the canvas it provides a base for the paint to adhere to without corruption. If you do not prime the paint will stain the raw canvas and bleed through to the back, diluting your paint and the color in the process. It also provides a 'tooth' (grip) for the paint and allows for other additives which can be mixed in to the gesso to change the texture before even painting. Some popular additives are pumice and fine sand. One coat can be enough but I like to apply at least 2 and 3 if I have the time. Tonight I am gessoing cards for the creation of more Tiny Talisman for the R-evol-u-tion project. The first 250 Tiny Talisman are on canvas card with texture already but I have purchased a high grade card with a coating of vellum, and will gesso for the next series of cards. It'll be interesting to see if the materials change the outcome in any way. I'll share pics so stay tuned! I write today so fulfilled with the R-evol-u-tion project and it has not yet been a week. It really has restored my faith that people want to be involved in positive action. Just the idea of leaving a Tiny Talisman for someone to randomly find seems to put a smile on peoples faces! Actually going out and leaving them around town had my friend and I grinning all afternoon. We felt like a kids in on a secret, it's exciting! I happened to see a woman walking down the street where I had hung a couple of Tiny Talisman earlier, I was actually waiting to pick up my child from school. She walked past the first one after spotting it but then on spotting a second a block further, must have realized the first was not something left for someone who may had dropped it. She retrieved it from the bush and popped it in her bag to open later. It is so fascinating to see different psychology at work. It never occurred to me people would not stop and pick them up but in hindsight it makes sense. People don't really want to do the wrong thing and pick up something that is not theirs. I hope she enjoyed opening it when she could. I've opened social media pages (fb: #R-evol-u-tion and Instagram #revolution_artwithheart) for people to share their experience with this project whether it be the making, the leaving or the finding of the Tiny Talisman. I have found the members who have joined the pages are as interested in seeing the pics people post as they are in the activity...seems this giving has many layers of joy. Thankfully, people are sharing too as the project only grows along with those who get on board. It may have initially started with the 200 Tiny Talisman I have made but many have pledged to create and share themselves. This is where I think it will get really exciting. We'll be able to see what different people create and hopefully some of the finders will start checking in. Of course if they don't it doesn't mean the project isn't working to make people smile, they may be social media shy or not have time or access but ultimately the idea of following the journey of the Talisman is secondary but it does add another layer of community to the project. I am truly grateful for the friends whom have helped deliver the original Talisman to area's further than I would travel on my own. It has made it so easy to get them out into the world. It takes a village. Feedback has helped me decide to remove the envelope the original Tiny Talisman were packaged in. I hope it makes the card more visible and the intent more obvious. This is just the beginning....the Love Revolution continues...A BIG thank you to everyone for helping spread love and goodwill in our communities! I finally took the plunge and worked on a painting on canvas with the same intention as I undertake a journal spread. I painted an abstract piece I liked very much but decided to push it further and consider it a sacrificial piece in order to satisfy the process. Our theme for November was fire. I painted her, I cut her up, I sewed her back together with thread and finally set her alight. She lives. She is transformed. Destruction is an interesting process in itself. When you put aside the judgement of 'breaking' something, or the idea of loss in regard to what you already had created, it allows you to let go of a desired outcome in powerful way. I often sacrifice what I have created for the pleasure of pushing further to see what comes next (as I am sure I have covered in previous posts regarding the multiple 'stopping points' an artwork has along the way of it's making) but the idea of incorporating scissors, thread and fire was new. I wonder if I will be cutting up and burning older works I have stored in the studio now? It is somewhat addicting! Art Journaling: The delight is in the detail. Collage work in the art journal. I am into month 5 of my year long art journaling course and still as inspired as I was in the beginning. It has really been an interesting learning curve. It's not just the techniques and topics that are inspiring but the digging in to personal narrative I find so exciting. I always have an internal dialogue when i am working, it is one of the reasons I love creating art as much as I do but removing the pressure of creating a piece on canvas is liberating, it removes the necessity of seeing work in progress as part of a body of work and allows a more personal investigation. The fact the materials are not expensive also helps to liberate the experimental nature of what I feel drawn to do next and no need to justify in terms of how that reads with work before it or after. The pages of my journal do seem to have a kind of sequential storyline but it is of their own natural unfoldment. I guess thats how the mind works, one thing leading to the next and here it is getting put down on pages that come after one another. It is interesting to look at with hindsight and see the connections more clearly, but I love the fact I am not thinking about any of that as I am creating. The delight is in the details. The tiniest piece of paper means something personal and although it may not be evident to anyone else viewing the work, each piece holds some meaning, has some significance to me. This little piece of drawing paper (pictured) is a potion of a self portrait I did in the very first month. I ripped one of the ink drawings up into smaller pieces and have been incorporating them along the way in various spreads. A letter to myself also got torn up and repurposed in among other detail on other pages. As I flip though the journal, I can see how bits of the story bleed over the spreads and unite them. I can't wait to see the finished book. I also find I have a personal style reading through the pages in much of a similar way my paintings have a signature feel to them. I guess thats what happens as you uncover your own visual language. I recognize that in my paintings because you notice these things over the years (16yrs to be precise) but the journaling is new and it feels more like a discovery again. I look forward to creating with the same unrestricted feeling on the canvas. Through journaling I have found another portal to self discovery. I am using art making as the medium to evoke memories of my own and unlock memories stored in my DNA because there are family members no longer on this Earth who's stories remain a mystery, as there was much they would not speak of while here. They are survivors of WWII. My Grandparents had the courage to travel with a small child (who later became my Mother) across Europe, from The Czech Republic to Italy to board a ship bound for a foreign country (Australia) in the hopes of creating a new life. They, along with many others, managed against all hardship to do exactly that. I am eternally grateful for the courage and faith they had in their ability and future, assuring mine. This spread is a way for me to connect more fully to their journey. I am surprised by the depth of emotion I have felt using this process of art journaling. The act of collaging old photographs, building and excavating layers of paint, pastel, ink and graphite, mirror the emotional digging, revealing and concealing so much more than I anticipated. It is a truly rewarding process and one that I will use as a means of expression, alongside of my daily painting practice. I am currently enrolled in an on-line art journaling course. It has had my full attention for the past 3 weeks. 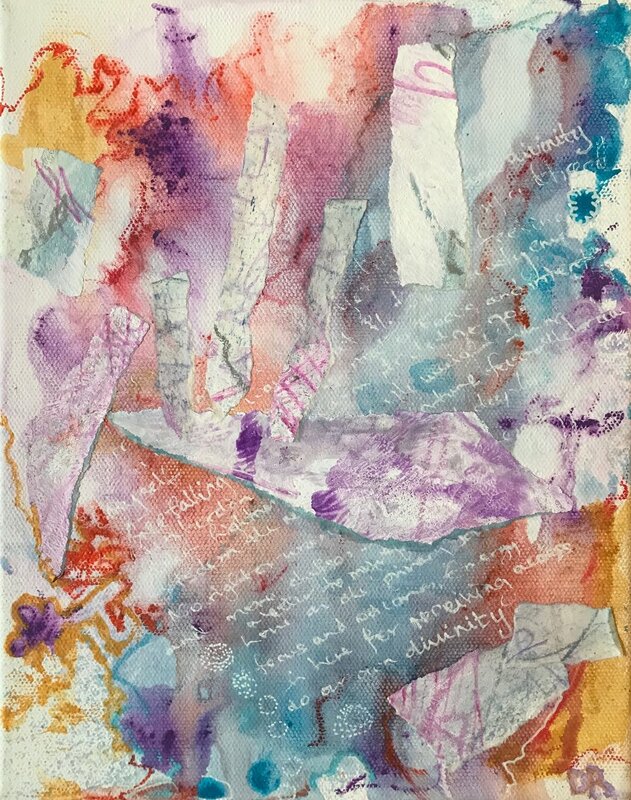 I have been absorbed in translating my painting process into the journal pages using different media. Oils take too long to dry to achieve the very quick results I need to work at the pace I am. Acrylic, collage, pastel, and ink are among the materials I have been playing with and it really is play. Each step has been a new path to explore, from the inner realms to the physical art creation. The two mirror one another as they do in creative flow but it has been a refresh button to abandon my known techniques and act on impulse alone and in the spirit of discovery without any other purpose. It is very freeing. The pages (double spread) have been given themes, all originating from a master theme of getting to know yourself. I am working through my heritage in various forms and formats. There's a truly rewarding dialogue that occurs along side of the creative process . Each mark, tear or paste a metaphor, something shifts in recognition inside. This is my 3rd spread. 'Siblings'. The most exciting moment is also the most anxious. Just before making your first mark. Once you have begun, it is exhilarating following each movement and inspiration to the next. By no means have I stopped my regular painting process but I have taken a little sabbatical to dive into the course instruction and pay attention to what comes next. It is already informing me of new directions.